The structure of NetworkX can be seen by the organization of its source code. The package provides classes for graph objects, generators to create standard graphs, IO routines for reading in existing datasets, algorithms to analyze the resulting networks and some basic drawing tools. Most of the NetworkX API is provided by functions which take a graph object as an argument. Methods of the graph object are limited to basic manipulation and reporting. This provides modularity of code and documentation. It also makes it easier for newcomers to learn about the package in stages. The source code for each module is meant to be easy to read and reading this Python code is actually a good way to learn more about network algorithms, but we have put a lot of effort into making the documentation sufficient and friendly. If you have suggestions or questions please contact us by joining the NetworkX Google group. Classes are named using CamelCase (capital letters at the start of each word). functions, methods and variable names are lower_case_underscore (lowercase with an underscore representing a space between words). To save repetition, in the documentation we assume that NetworkX has been imported this way. If importing networkx fails, it means that Python cannot find the installed module. Check your installation and your PYTHONPATH. This class implements an undirected graph. It ignores multiple edges between two nodes. It does allow self-loop edges between a node and itself. Directed graphs, that is, graphs with directed edges. Provides operations common to directed graphs, (a subclass of Graph). 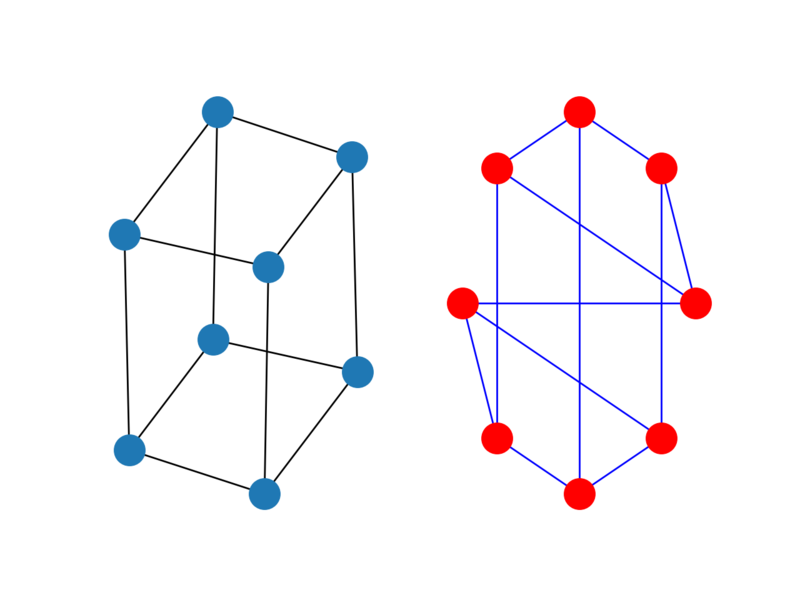 A flexible graph class that allows multiple undirected edges between pairs of nodes. The additional flexibility leads to some degradation in performance, though usually not significant. A directed version of a MultiGraph. All graph classes allow any hashable object as a node. Hashable objects include strings, tuples, integers, and more. Arbitrary edge attributes such as weights and labels can be associated with an edge. The graph internal data structures are based on an adjacency list representation and implemented using Python dictionary datastructures. The graph adjacency structure is implemented as a Python dictionary of dictionaries; the outer dictionary is keyed by nodes to values that are themselves dictionaries keyed by neighboring node to the edge attributes associated with that edge. This “dict-of-dicts” structure allows fast addition, deletion, and lookup of nodes and neighbors in large graphs. The underlying datastructure is accessed directly by methods (the programming interface “API”) in the class definitions. All functions, on the other hand, manipulate graph-like objects solely via those API methods and not by acting directly on the datastructure. This design allows for possible replacement of the ‘dicts-of-dicts’-based datastructure with an alternative datastructure that implements the same methods. Directed: Are the edges directed? Does the order of the edge pairs \((u, v)\) matter? A directed graph is specified by the “Di” prefix in the class name, e.g. DiGraph(). We make this distinction because many classical graph properties are defined differently for directed graphs. 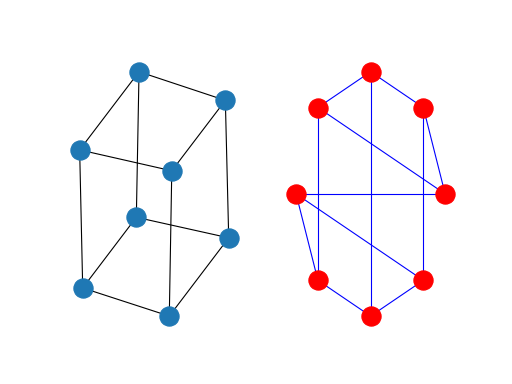 Multi-edges: Are multiple edges allowed between each pair of nodes? As you might imagine, multiple edges requires a different data structure, though clever users could design edge data attributes to support this functionality. We provide a standard data structure and interface for this type of graph using the prefix “Multi”, e.g., MultiGraph(). The next choice you have to make when specifying a graph is what kinds of nodes and edges to use. If the topology of the network is all you care about then using integers or strings as the nodes makes sense and you need not worry about edge data. If you have a data structure already in place to describe nodes you can simply use that structure as your nodes provided it is hashable. If it is not hashable you can use a unique identifier to represent the node and assign the data as a node attribute. Edges often have data associated with them. Arbitrary data can be associated with edges as an edge attribute. If the data is numeric and the intent is to represent a weighted graph then use the ‘weight’ keyword for the attribute. Some of the graph algorithms, such as Dijkstra’s shortest path algorithm, use this attribute name by default to get the weight for each edge. Attributes can be assigned to an edge by using keyword/value pairs when adding edges. You can use any keyword to name your attribute and can then query the edge data using that attribute keyword. Once you’ve decided how to encode the nodes and edges, and whether you have an undirected/directed graph with or without multiedges you are ready to build your network. Graph generators—standard algorithms to create network topologies. Importing data from pre-existing (usually file) sources. Adding edges and nodes explicitly. See the Tutorial for more examples. Some basic graph operations such as union and intersection are described in the operators module documentation. Graph generators such as binomial_graph() and erdos_renyi_graph() are provided in the graph generators subpackage. For importing network data from formats such as GML, GraphML, edge list text files see the reading and writing graphs subpackage. Class views provide basic reporting of nodes, neighbors, edges and degree. These views provide iteration over the properties as well as membership queries and data attribute lookup. The views refer to the graph data structure so changes to the graph are reflected in the views. This is analogous to dictionary views in Python 3. If you want to change the graph while iterating you will need to use e.g. for e in list(G.edges):. The views provide set-like operations, e.g. union and intersection, as well as dict-like lookup and iteration of the data attributes using G.edges[u, v]['color'] and for e, datadict in G.edges.items():. Methods G.edges.items() and G.edges.values() are familiar from python dicts. In addition G.edges.data() provides specific attribute iteration e.g. for e, e_color in G.edges.data('color'):. The basic graph relationship of an edge can be obtained in two ways. One can look for neighbors of a node or one can look for edges. We jokingly refer to people who focus on nodes/neighbors as node-centric and people who focus on edges as edge-centric. The designers of NetworkX tend to be node-centric and view edges as a relationship between nodes. You can see this by our choice of lookup notation like G[u] providing neighbors (adjacency) while edge lookup is G.edges[u, v]. Most data structures for sparse graphs are essentially adjacency lists and so fit this perspective. In the end, of course, it doesn’t really matter which way you examine the graph. G.edges removes duplicate representations of undirected edges while neighbor reporting across all nodes will naturally report both directions. Any properties that are more complicated than edges, neighbors and degree are provided by functions. For example nx.triangles(G, n) gives the number of triangles which include node n as a vertex. These functions are grouped in the code and documentation under the term algorithms. A number of graph algorithms are provided with NetworkX. These include shortest path, and breadth first search (see traversal), clustering and isomorphism algorithms and others. There are many that we have not developed yet too. If you implement a graph algorithm that might be useful for others please let us know through the NetworkX Google group or the Github Developer Zone. While NetworkX is not designed as a network drawing tool, we provide a simple interface to drawing packages and some simple layout algorithms. We interface to the excellent Graphviz layout tools like dot and neato with the (suggested) pygraphviz package or the pydot interface. Drawing can be done using external programs or the Matplotlib Python package. Interactive GUI interfaces are possible, though not provided. The drawing tools are provided in the module drawing. The basic drawing functions essentially place the nodes on a scatterplot using the positions you provide via a dictionary or the positions are computed with a layout function. The edges are lines between those dots. See the examples for more ideas. NetworkX uses a “dictionary of dictionaries of dictionaries” as the basic network data structure. This allows fast lookup with reasonable storage for large sparse networks. The keys are nodes so G[u] returns an adjacency dictionary keyed by neighbor to the edge attribute dictionary. A view of the adjacency data structure is provided by the dict-like object G.adj as e.g. for node, nbrsdict in G.adj.items():. The expression G[u][v] returns the edge attribute dictionary itself. A dictionary of lists would have also been possible, but not allow fast edge detection nor convenient storage of edge data. Find edges and remove edges with two dictionary look-ups. Prefer to “lists” because of fast lookup with sparse storage. Prefer to “sets” since data can be attached to edge. G[u][v] returns the edge attribute dictionary. n in G tests if node n is in graph G.
for n in G: iterates through the graph. for nbr in G[n]: iterates through neighbors. As an example, here is a representation of an undirected graph with the edges \((A, B)\) and \((B, C)\). The data structure gets morphed slightly for each base graph class. For DiGraph two dict-of-dicts-of-dicts structures are provided, one for successors (G.succ) and one for predecessors (G.pred). For MultiGraph/MultiDiGraph we use a dict-of-dicts-of-dicts-of-dicts  where the third dictionary is keyed by an edge key identifier to the fourth dictionary which contains the edge attributes for that edge between the two nodes. Graphs provide two interfaces to the edge data attributes: adjacency and edges. So G[u][v]['width'] is the same as G.edges[u, v]['width'].